Excellent color reproduction, gorgeous color, not color cast. Applicable to synthetic fabrics such as polyester fabric, smooth feel comfortable, no hard feeling. Transferred pattern scratch-resistant, washable, non-cracking, no peeling, no fading, and good weather resistance. It it used on all kinds of offset machine. With the ink,first print image on paper, then transfer the image onto various materials by heat transfer press, especially for polyester fabric. Under high temperature, the ink will become gas and go into fabric. (1)Be able to adapt to the demand for middle-speed or high-speed printing. (2)During the normal condition, use the ink on the machine directly. (1)Print the image on paper, and normal paper is ok.
(2)Put the printed paper on substrate, such as polyester and nylon fabric. (3)Put the paper and fabric on the heat-transfer machine. When the temperature reaches 180-220°C, the image will be transfer printed from paper onto the substrate. Coated paper, offset paper,chrome paper and calendered paper. Transfer paper should be 80-90 gr/m2 with dimensional stability. The control of the colors is always carried out after the transfer of the final supports. 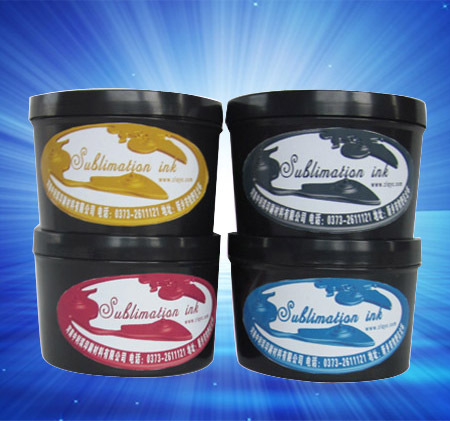 The relationship between the temperature and the time of contact is important in order to have the optimal color resistance and ink penetration (the longer the time of transfer, the better the ink penetration of the fabric).